I admit it was odd to hear the construction industry organizing a running event. I know they’re all “macho” and strong and active… but images of nails, hammers, and paints are the things that come up in my mind when I first heard of PhilConstruct Visayas Run. Of course, I was not disappointed to be in a room of engineers during the press conference. 1. Visit the San Pedro Calungsod Templete. 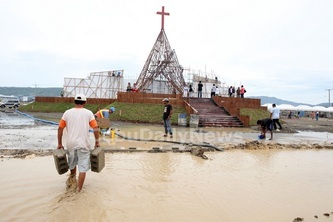 Unknown to many, the templete was build with the help from Cebu Contractors Association. Even if you’re not Catholic, it will be great to visit it as it is an officially declared heritage landmark of Cebu. Cebu is home of some of the great artists and designers, and seeing this creation is one way of experiencing Cebuano’s ingenuity. 2. Help build more environment-friendly green classrooms in Cebu, a project of Philippine Institute of Civil Engineers (PICE). PICE will be the beneficiary of the PhilConstruct Visayas Run, half-marathon in Cebu. It’s a nationwide campaign. In Cebu, the first PHILGREEN SCHOOL classroom was build in Ocaña Central School, Carcar City. The next will be in Pakn-an, Mandaue City. 3. Get a new PR (personal record or PB – personal best) for half-marathon (or for your 12K/6K/3K run), or simply run in the scenic SRP (South Road Properties). It’s rare to find a race in Cebu that uses SRP. And, this is your chance to run the SRP again, or for the first time. Half of the SRP will be closed for this event so you don’t need to worry about dealing with car traffic. 4. Run with our Cebu builders. You will only not run in a heritage site and landmark, San Pedro Calungsod Templete & SRP, but you will also get the chance to run with the people behind it, the people who worked hard for these structures to become reality. Yesterday, during the press conference, the CCA members mentioned that they encourage the other association members to sponsor their staff to join the running event. This will also be our chance to show our support and appreciation to our dear brothers and sisters in the construction industry. This running event is created by the CCA / PCA as a thanksgiving celebration. This will be the culminating event for their 3-day exhibit in Waterfront Lahug this coming June. This exhibit has been ongoing for 3 years already, and they are grateful for the wonderful outcome. And, I guess for everyone of us, it will be a perfect mid-year thanksgiving celebration too for being able to survive half of the year, and to ask for guidance for the upcoming half of the year! Not to mention, this is definitely a bang-for-your-buck race. Where could you find a half-marathon race in SRP that is that much affordable? Let’s support our fellow Cebuano engineers, builders, suppliers of Cebu Construction Association and Philippine Construction Association with their running event. With a running event coming from a dedicated group of people, PhilConstruct Visayas Industry Run will be a good addition to Cebu’s symbolic runs / races that we can be proud of which we can look forward to every year.